With Valentine’s Day around the corner and New Year’s Resolutions just behind us, I figured it was as good a time as any to talk about the concept of food addiction or more specifically, sugar addiction. I have been interested in the science of food addiction for about 6 years now. My interest stems from the fact that when I first heard the term thrown around it never sat right with me. Frankly, the rhetoric felt eerily similar to the fear mongering /pseudoscience language that the dieting industry capitalizes on so successfully. The tenets of food addiction also didn’t square with my clinical experience. And yet, conceptually, it captures how so many people feelin relationship to food. This led me down the rabbit hole of addiction research and I wrote about it and spoke about it quite a bit over the past 5 years. A couple of weeks ago, I was invited on to the podcast (a fantastic podcast I might add), Don’t Salt My Game, with Laura Thomas, a smart and sassy dietitian based in London. She invited me on to discuss sugar addiction but we ended up talking about so much more! Her invitation forced me to get current with the scientific literature. If you are interested in this topic, I highly recommend you listen to the podcast in its entirety. We also delve into topics related to body image and self-acceptance – juicy stuff!! But if an hour-long podcast isn’t your thing, below are a few take-home points I’d to share with you. For those science geeks out there – this article is for you. 1. To date there is absolutely zero scientific evidence that particular foods are addictive nor is there an objective measure with which food addiction can be explained. All of the human research that demonstrates “addiction” is based on the use of the Yale Food Addiction Scale, which is a reflection of an individual’s experience with food and does not account for dieting or restriction. There is ample neurobiological data that restriction amplifies the saliency (read attractiveness and yumminess) of food. Take home message: A person’s felt sense of being out of control or addicted to food is not the same thing as having scientific evidence that it is occurring at the physiological level. 2. Food addiction as an explanation for higher weight is very bad science. Currently, amplified neurobiological responses to sugar intake do not even correlate to BMI. Take home message: You can’t explain higher weights by turning those individuals into addicts. This theory is fueled by weight stigma and perpetuating it reinforces faulty assumptions about how higher weight individuals live their lives. If you are looking to learn more about weight stigma, you can check out my free guide. 3. When looking at the animal research, the only time rodents consume sugar in an “addictive-like” way is when they have intermittent access to it. When the rodents have unlimited access to sugar, they do not demonstrate addiction-like behavior. 5. Yes, it is true that food and drugs share common neural pathways. However, it is understood that drugs “hijack” food’s natural reward pathway. Additionally, more problematic is that food addiction scientists have been using study designs that scientists studying drugs abandoned long ago because of the inherent design problems. This leaves us with questionable data at best. Additionally, food cravings lessen with fasting whereas drug cravings do not lessen over time, indicating that there are important differences between the two. Take home message: Don’t fall victim to headlines. Just because food and drugs share common neural pathways does not mean that food is addictive. There is far more to the story. The authors go on to propose that, given the total lack of evidence for sugar addiction, the data is likely pointing to well-established phenomena that fall under the category of disordered eating behavior. I have to leave you with words from the authors directly because it is just so good. 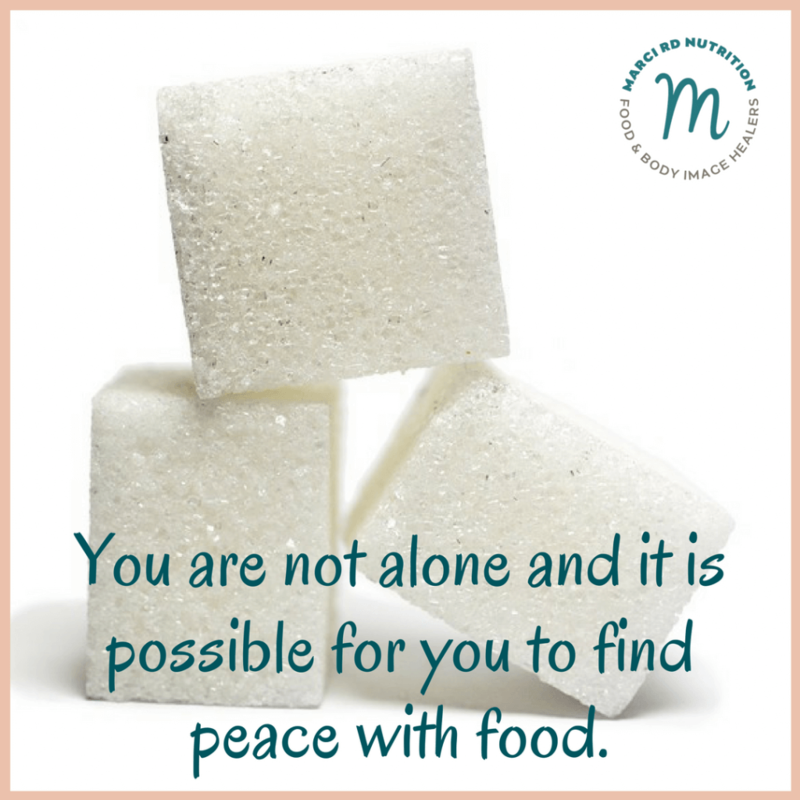 To you, I say, you are not alone and it is possible for you to find peace with food. But abstinence and self-restraint won’t get you there. Consider working with a trained eating disorders professional in your area and trust that healing is possible, yes, even for you.